Granola is great anytime of day. Try it on some Greek yogurt and fruit for breakfast. Looking for a snack at night? Put it on top of a scoop of your favorite ice cream. This recipe comes from Dubie Family Farm located in Sheldon, VT. 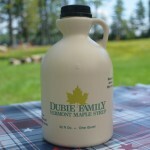 They are a family owned and operated business were they have been producing the best pure Vermont Maple Syrup for 14 years. Directions: In a large bowl, combine the oats, coconut, wheat germ, nuts, seeds, and milk powder. Mix well. In a separate bowl, whisk together the salt, oil, maple syrup, and vanilla. Pour over dry mixture in bowl, stirring and tossing till everything is very well combined. Spread granola on a couple of large, lightly greased baking sheets. Bake in a preheated 250°F oven for 90 minutes +-. tossing and stirring mixture every 15 minutes or so. Should not be browned too much but on dry side. will dry as it cools.Remove pans from oven and cool completely. 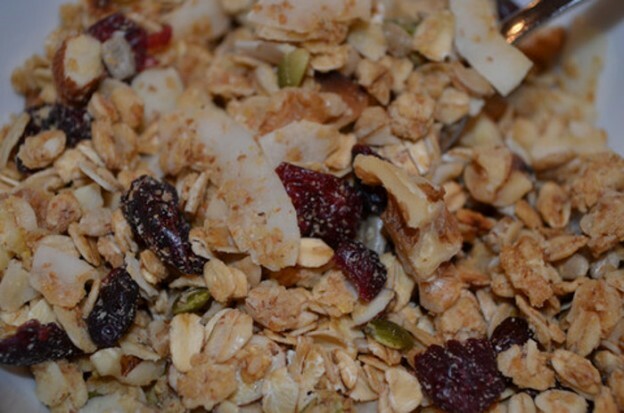 Transfer granola to a large bowl, and mix in dried cranberries. Thanks to Marianne and Dubie Family Maple for the Maple Granola Recipe!! This entry was posted in Food, Now Trending on March 16, 2016 by Linda Cassella.